We love a good curry. When cooked at home, curry makes for a tasty lunch or mid-week dinner that also provides delicious leftovers (that is – if there are any leftovers!). Personally, I also love the that a delicious curry can be knocked up in one pot, so it’s easy on the cleanup too. Unfortunately, store-bought curry sauces and pastes are most often based on inflammatory vegetable oils and contain processed sugar, stabilisers and preservatives. So for us, eating a paleo / whole foods diet means skipping these store-bought sauces and embracing the art of cooking with spices. 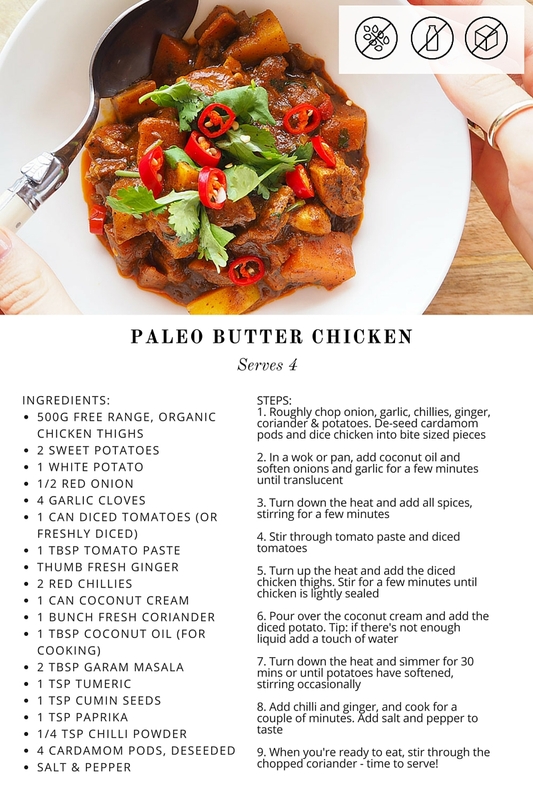 Today we’re sharing a favourite of ours – paleo butter chicken. This is a creamy, hearty curry with plenty of flavour and heat. To make it paleo, we actually skip the rice and add carbohydrate to this curry by adding potato. It’s up to you whether you use sweet or white potatoes, and the starch from the potato makes for a nice, thick curry that does’t require rice. However – feel free to pile this curry on top of rice / cauliflower rice if that’s your jam! CLICK HERE FOR A PRINTABLE COPY OF THIS RECIPE! Prep your ingredients – roughly chop the onion, garlic, chillies, ginger, coriander and potatoes. Keep in mind that smaller chunks of potato (think the end of your thumb) are best, as they take less time to soften. De-seed your cardamom pods, and dice the chicken into bite sized pieces. Turn your wok or pot to a medium heat and add a tablespoon of coconut oil. Soften the onions and garlic for a few minutes, until they are becoming translucent. Time to add spices! Turn the heat down a tad, and add all the spices (including the cardamom seeds) to the pot and stir for a minute or two. Tip – this is really important for releasing the flavour in the spices! Add your tomato paste and diced tomatoes, and stir to combine. This should now be looking like a rich curry paste – yum! Turn the heat back up, and add the diced chicken thighs. Stir for a couple of minutes, until the chicken is lightly sealed. Pour over the coconut cream and combine, then add in your chopped potatoes. Hint – if there’s not enough liquid, add a touch of water. The starch in the potatoes will ensure you still get a nice, thick curry. Turn the heat down, and simmer for approximately 30 minutes, or until the potatoes have softened. Stir the curry occasionally to make sure nothing gets cooked to the bottom! Add your more delicate ingredients, starting with the chilli and ginger, and cook for a further couple of minutes. Add salt and pepper, to taste. When you’re ready to eat, add the fresh coriander and stir through. Now it’s time to plate up!